Founded in 1857, Illinois State University is the state's first public university, and is one of the Midwest's oldest institutions of higher education. It is a co-educational, residential university with an emphasis on the undergraduate program, offering more than 188 fields of undergraduate study across 34 academic departments. The Graduate School coordinates 39 master's, two specialist and nine doctoral programs. The 350-acre campus includes more than 60 major buildings with state-of-the-art technology, and Watterson Towers is one of the most unique structures, as this residence hall is the tallest building between Chicago and St. Louis. 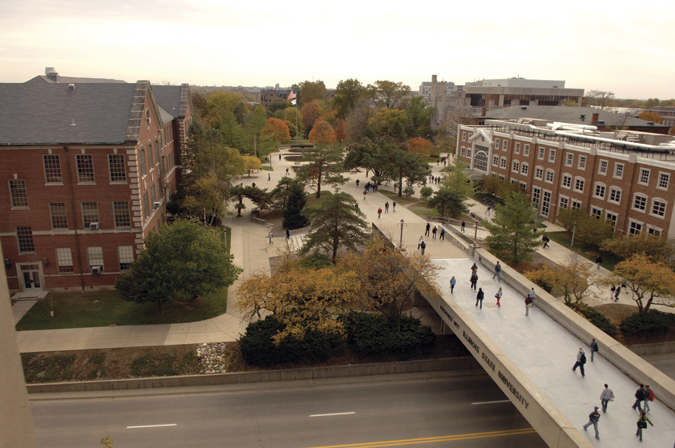 Other major facilities include a Center for the Performing Arts, a 360-acre farm, Bone Student Center and Braden Auditorium, a University Planetarium, Redbird Arena, and Hancock Stadium. From meeting facilities to cultural opportunities through the arts and excitement of numerous sporting events each year, ISU is a vital part of the Bloomington-Normal community. Meeting Space: 74,000 sq ft Illinois State University's unique blend of facilities can accommodate groups from 10 to 10,000. Illinois State University offers your organization state-of-the-art meeting rooms and auditoriums classrooms equipped with advanced technology, quality food service, residence hall accommodations for 7,000 recreational facilities, business support services, and a rich cultural environment. Conference Services offers customized marketing and communication expertise, conference/event coordination and planning, and registration services on campus or anywhere in the United States.